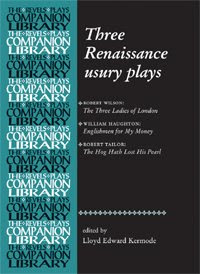 This book provides for the first time modern-spelling, fully annotated editions of three important Elizabeth and Jacobean ‘usury plays’ – The Three Ladies of London, Englishmen for My Money, The Hog Hath Lost His Pearl. The edition includes an extensive scholarly introduction to the attitudes toward money-lending in early modern England, and to the authors, texts and historical contexts of this drama. The plays included in this edition also represent examples of ‘city plays’ and ‘alien plays’, thus making them widely relevant to scholars and teachers in many areas of early modern studies. They are also gaining new appreciation in their own right. As befits a volume in the Revels Plays Companions Library series, the edition is academically advanced to cater for specialised scholars. However, the introduction, editing and annotation remain accessible for undergraduates and theatregoers. Please click on the title for more information, including details on how to order. Category: Literature, Theatre Studies	12 Comments.